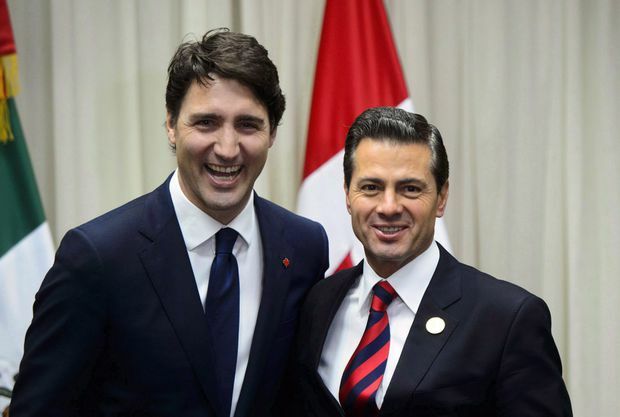 Prime Minister Justin Trudeau meets with Mexican President Enrique Pena Nieto in Lima on Friday, April 13, 2018. Mexico and Canada renewed their commitment to the bare-knuckled NAFTA renegotiation after absorbing the blow of the Trump administration's decision to impose potentially debilitating new tariffs on steel and aluminum imports. U.S. President Donald Trump says he’d prefer to see separate bilateral trade deals with Canada and Mexico instead of the current North American free-trade agreement. Mr. Trump says – as he has many times before – that NAFTA has been a terrible deal for the United States, while its North American trading partners make “many billions of dollars” at the expense of Americans. And he suggested Friday that the idea of a trilateral trade deal doesn’t make sense – a notion he has floated before as a possibility, should the current NAFTA talks fail to reach a consensus. “To be honest with you, I wouldn’t mind seeing NAFTA where you’d go by a different name, where you’d make a separate deal with Canada and a separate deal with Mexico,” he said Friday after a meeting with North Korean officials. Mr. Trump also defended his decision to hit Canada, Mexico and the European Union with hefty steel and aluminum tariffs, a move that some observers say has made the efforts to rescue NAFTA that much more of an uphill climb. Canada retaliated for the tariffs Thursday with $16.6-billion worth of “countermeasures” that hit a range of products from flat-rolled steel to playing cards, while Mexico also plans tariffs on a variety of U.S. products, including flat steel. “If you take the European Union and you see the kind of tariff they charge, and then we don’t, that’s called not fair trade,” Mr. Trump said.